This programme is the first joint effort with TWR Video. It is also the first Steam Age production shot entirely on high definition HDV cameras. However, because I was still running a fairly old computer, it was edited in standard definition and output to DVD only. One day I hope to re-edit it in HD from the orignal tapes and produce a Blu-ray; just don’t hold your breath! Paddington–Badminton–Bristol. 71000 Duke Of Gloucester. Uffington; Hullavington. (2:34) YouTube clip. 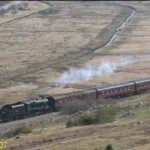 Penzance–Exeter–Bristol. 5051 Earl Bathurst & 6024 King Edward I. Burngullow; Coombe Fishacre; Burlescombe. (3:59) YouTube clip. Bristol–Hereford–Chester–Preston. 71000 Duke Of Gloucester. Narroways Junction, Bristol; Coton Hill, Shrewsbury; Dee viaduct, Cefn bychan. (03:09) YouTube clip. Bank Holiday Monday 9th April. Bristol-Didcot. 5051 Earl Bathurst, light engine. Uffington. 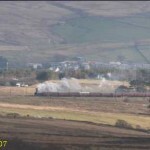 Preston–Shap–Beattock–Glasgow. 6233 Duchess Of Sutherland. Shap Wells; Beattock summit; Cleghorn. (7:17) YouTube clip. Glasgow–Perth–Inverness. 60009 Union Of South Africa & 61994 The Great Marquess. 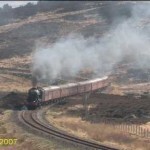 Blackford (61994 light engine); Kinbuck; Blackford; Murthly; Edendon signalbox; Kincraig; Slochd; Slochd Mor; Inverness. (11:38) YouTube clip. Inverness–Kyle Of Lochalsh–Inverness. 61994 The Great Marquess. Fodderty; Achterneed; Garve; Corriemoillie summit; Loch Chuilinn; Achnasheen; Luib summit; Atterdale; Kyle of Lochalsh; Achmore; Stomeferry & Loch Carron from Strome Castle; Glen Carron; Achnasheen; Loch Chuilinn; Rogie. (26:14) YouTube clip. Inverness–Thurso. LMS 8F 48151. Dingwall & Cromarty Firth; Evanton; Lairg (three locations); Brora; Loth; Strath of Kildonan; Kinbrace; Thurso. (13:28) YouTube clip. Inverness–Perth. 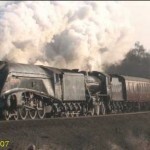 60009 Union Of South Africa & 61994 The Great Marquess. 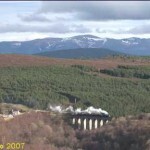 Inverness; Findhorn viaduct, Tomatin; Aviemore; Dalwhinnie to Balsporan Cottages; Dunkeld & Birnam station. (8:50) YouTube clip.